At age 15, most normal people are going to high school, learning to drive, not listening to their parents, and doing things that they’ll later tell their kids not to do. Josh Buckley is not a normal teenager. At 15, he was selling his first company for just over six figures. Today, the 18-year-old entrepreneur and angel investor has partnered with 17-year-old engineer Tyler Diaz to co-found MinoMonsters, a social game in which players collect and battle pet monsters. As for the game: MinoMonsters is basically what Pokemon would look like if it were started today. The company that Buckley sold when he was 15, Menewsha, was an online community that produced customizable avatars. MinoMonsters’ impressive graphics owe their style both to Buckley’s prior work with avatar animations as well as the renderings of Pokemon and Japanese anime. As such, the social game allows you to adopt and name various pet monsters, after which you can embark on quests across the game’s virtual world, battling your friends’ monsters to earn pieces of gold. You can then use this currency to buy different items, like potion to improve your health. You can also invite friends, and share your conquests on Facebook. There’s a great voice-over (that sounds like it’s narrated by some martial arts-hardened Japanese actor) and interactive tutorial that will walk you through the game’s backstory and teach you how you how to develop your different attack moves. Over the last few years, Zynga has proven that social games are no longer played only by kids, so MinoMonsters is making an effort to offer deeper content and more detailed character bios (than, say, Pokemon), hoping that enriched features and the game’s availability on a number of different platforms, will encourage people of all ages to join. Initially, Buckley and Diaz launched MinoMonsters as a website-only project, but Facebook Founder Jesse Eisen … er … Mark Zuckerberg, Buckley told me, convinced them to port the game over to the social network, which they were able to do in less than a week. Obviously, if you get a personal invitation from Zuck, you can’t turn him down. The startup soft launched last month and has been growing quickly since. Within a week, the game had amassed 25,000 players, and today the site’s data shows that it has just under 95,000 active monthly users. The startup has already raised money from Y Combinator, and Yuri Milner and SV Angel’s Start Fund. And the company is currently in the process of raising another angel round. When asked if he had any advice for aspiring young entrepreneurs, Buckley said that young guns should surround themselves with “brilliant people and other entrepreneurs. Trust your gut and learn from the experience of others”, he said. “It’s a deadly combination”. 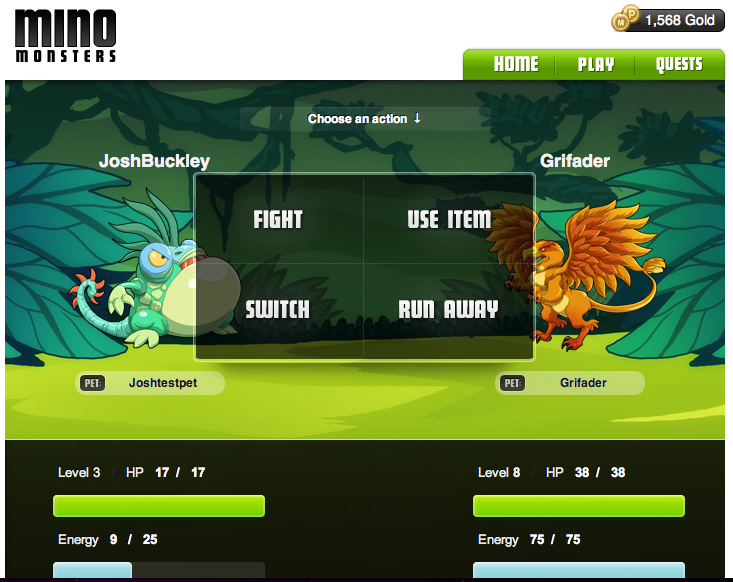 MinoMonsters is currently available at its website and on Facebook, and a mobile app is in the works. TechCrunch readers can visit this splash page to get 5 free bonus points.